Make your little one's eyes light up with joy when they see their very own My Life As 18&quot; Space Engineer Doll. Perfect for the child who loves space, this toy features an adorable satin-like orange jacket with the American flag and NASA logos and a working zipper, a gray sleeveless undershirt, shiny blue pants, and two gray shoes. 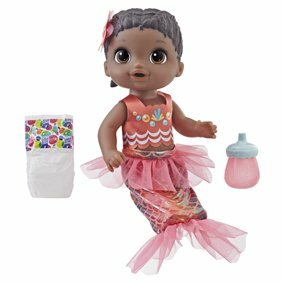 The fully poseable doll, soft torso has eyes that open and close and long brunette hair that can be brushed and styled almost any way your child imagines. As part of the full collection of My Life As dolls, the My Life As 18&quot; Space Engineer Doll provides hours of playtime for any child and makes a wonderful Christmas, Hanukkah, holiday, or birthday present. Make your little one's eyes light up with joy when they see their very own My Life As 18" Space Engineer Doll. Perfect for the child who loves space, this toy features an adorable satin-like orange jacket with the American flag and NASA logos and a working zipper, a gray sleeveless undershirt, shiny blue pants, and two gray shoes. The fully poseable doll, soft torso has eyes that open and close and long brunette hair that can be brushed and styled almost any way your child imagines. As part of the full collection of My Life As dolls, the My Life As 18" Space Engineer Doll provides hours of playtime for any child and makes a wonderful Christmas, Hanukkah, holiday, or birthday present. My daughter got this doll and the American girl Luciana doll for her birthday, in the picture American girl is on the left and mylifeasdolls is on the right (wearing an American girl doll outfit). They are almost identical and as such American girl accessories fit perfect. both are good, American girl is better quality but it's also 4x the price, honestly putting these next to each other they both look great and because you can use AG accessories it's almost a no brainier to check this out.